Riverpath has all the comforts you desire at your fingertips. 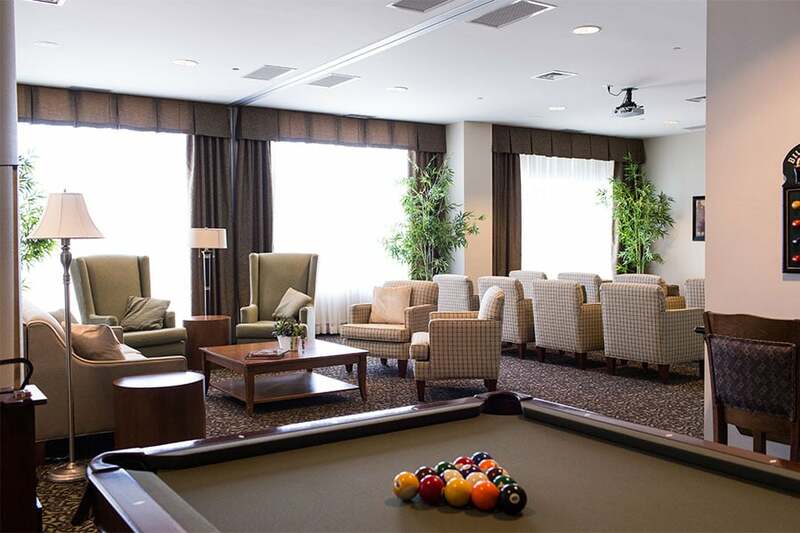 Residents can meet in small or large groups, enjoy chatting with their closest friends, or getting together with all of the residents for meetings, parties and entertainment. All common areas are comfortably air-conditioned, equipped with modern fire alarm and sprinkler systems, and surveillance cameras monitoring entrances and exits. The entire building is smoke-free including all residents’ suites. Our facilities include an indoor saltwater fitness pool, piano-lounge with pool table and snack bar, movie theatre, fitness centre, arts & crafts room, fireside library with computer access, and solarium for year-round natural sunlight. Our rooftop terrace features breathtaking views of Ottawa and Gatineau, raised garden beds, gazebo, and shuffle board court. We also offer onsite: convenience store, beauty salon spa, and demonstration kitchen for cooking classes. We will be more than happy to answer any questions you may have in regards to the Riverpath Retirement Community. Talk soon!